Siem Industries (SEMUF.PK) is a holding company with interests in shipping, petroleum-related marine construction and support, potash mining and a few other industries. While the company is headquartered in the Cayman Islands, the majority of the company’s holdings are based in Norway. Hat tip to Theodor Tonca for alerting me to this fascinating company. Siem Industries trades at a substantial discount to the market value of its publicly-traded holdings, let alone its other substantial holdings. There are multiple reasons why this discount has developed. 1. The well-known market phenomenon known as the conglomerate/holding company discount. Simply put, companies that engage in multiple unrelated lines of business tend to trade at lower valuations than their focused peers. 2. Illiquidity and control. Over 70% of the company’s shares are owned by Kristian Siem and his family. The company estimates that only 5% of shares outstanding are available for trading. 3. And the most important, economics. The shipping industry is suffering from severe over-capacity issues, depressing prices below break-even levels in many cases. Worse, many of the profitable contracts that shippers executed in 2008 and earlier are now rolling off to be replaced at much lower rates. Siem Industries also holds a minority stake in a German potash mining company, Deusa International GbmH, and various other interests in insurance and pharmaceuticals. Since the market value of these investments is not ascertainable and they make up only a small part of Siem Industries’ value, I have chosen to ignore their value for the sake of conservatism. 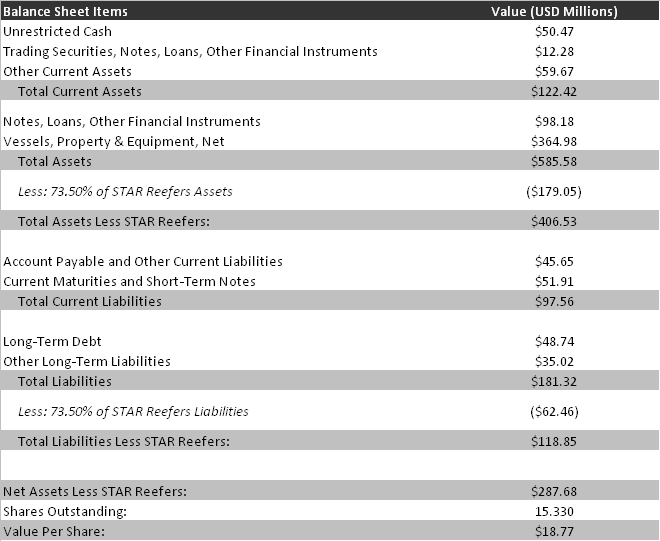 STAR Reefers’ financials are consolidated with the parent company, but the rest of these public and private investments are accounted for on the balance sheet and income statement using the equity method. What this means is that only the firm’s proportional share of net profits or losses shows up on the income statement. On the balance sheet, only the cost basis of these investments appears, adjusted for the firm’s cumulative share of net profits or losses. The actual market value of these investments may be significantly higher or lower than what is reflected on the balance sheet. Siem Industries also owns 100% of the share capital of Siem Car Carriers Inc. This company operates vessels that carry automobiles and was profitable in 2009 and 2010. The company also possesses assets in the form of loans and lines of credit issued to subsidiaries for capital expenditures. The company has roughly $50 million in unrestricted cash at the parent company level against a little over $100 million in debt outstanding. The company’s current ratio is 1.25, perhaps a little low by the standards of normal companies. Remember, however, that the company possesses billions of dollars in publicly-traded assets that can be sold at any time. Liquidity is really not an issue. Below is Siem Industries’ adjusted balance sheet, less the balance sheet value of the company’s equity-accounted subsidiaries (Subsea 7, Siem Offshore, and the company’s private investments.) The consolidated portion of STAR Reefers’ assets and liabilities has also been removed. Leaving it in would be double-counting the value of Siem Industries’ stake in the company, since it has already been accounted for in the publicly-traded assets summary. This $18.77 value for the company’s wholly-owned assets assumes that they are worth exactly book value. The estimated value of Siem Industries’ net assets, public and private, sum up to $161.37 per share, quite a bit above the current trading price of a bit over $64 per share. Put differently, the firm’s assets are worth an estimated $2.474 billion versus a market capitalization of $987 million. So, the firm’s assets are worth quite a bit more than the firm’s trading price. But how’s management? Has Kristian Siem succeeded in building value for shareholders over time? The answer is yes. Rather than being just a sleepy holding company, Siem Industries has a history of wheeling and dealing and compounding book value per share rapidly along the way. I was only able to obtain annual reports going back to 2001, but from 2001 to the end of fiscal 2010, the company grew book value per share at an impressive 20.3% annually, adjusted for small dividends paid out along the way. At the same time, the diluted share count shrank by 9.8% since 2001. The last decade’s energy boom certainly helped matters, but Siem Industries still managed to outpace the S&P Energy Sector SPDR’s total return over the same time period by 7.7% annually. Siem Industries faces economic headwinds, but the huge discount to asset value combined with management’s demonstrated skill may make the company an attractive holding for the long run. Shares are difficult to obtain, so any purchaser will want to use limit orders and as always, be patient. No position, but I may purchase shares in the next week. Thanks for the great link. All kinds of interesting companies to look at in that report. Any idea why the latest financial report is Q2 2011? Unfortunately, the company is a little sporadic with its quarterly reporting. Annual reports always come out, as well as any material news events. The company didn’t file a Q3 report in 2010 either. The 2011 annual report should come out any time. Siem had a nice run-up from early 2012 to late 2014. It’s now back down to $65…close to were it was in early 2012. I assume this is due to the decline in oil?? Looks like a good entry point again. Are you still following this name? Did you sell out on the way up or still holding?